Winter is finally here, and it’s making its presence known to my poor skin. My skin is generally healthy during the warm months, but when winter hits, I feel like I’m covered in sand paper. I have seriously snagged my sweater on my arms! That’s why I was so excited to take the #VaselineChallenge. This post, Vaseline® Intensive CareTM Advanced Repair at Walmart was sponsored by Lunchbox, but all opinions are 100% my own. Winter is the absolute worst for my skin. The extreme changes in temperature from going from inside to outside, coupled with the effects of the extremely dry air, quickly dries out my skin. 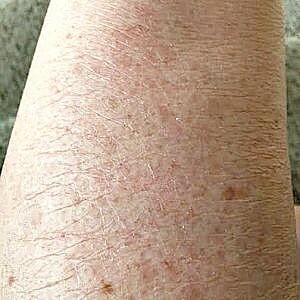 What was once soft beautiful skin becomes a dry, scratchy, flaky mess. It’s not pretty. 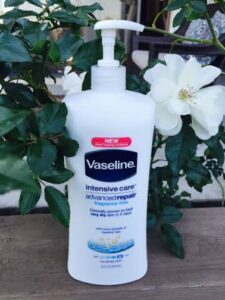 Vaseline Intensive Care Advanced Repair Lotion is the perfect way to combat the horrible effects of winter weather the skin. Its thick, rich formula combines micro-droplets of Vaseline Jelly with a very high level of glycerin. It soaks into my skin quickly, and it’s not oily. It gets deep into my skin to repair it from the inside instead of just laying on top of my skin. I told you that my dry, scratchy skin was snagging on my sweater, and that’s no exaggeration. I actually found sweater fuzz stuck to my skin like Velcro! Once, while my husband and I were in bed, he asked me why I kept scratching him. It was the dry skin on my legs! When I was invited to take the #VaselineChallenge, I jumped on it. I could not ignore my cracked and dry skin any longer. 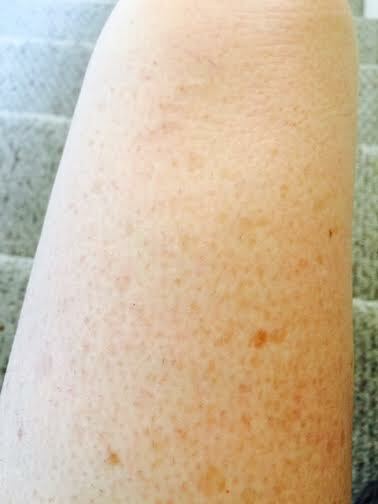 I took before and after photos of a portion of my legs where the dry unattractive “riverbed” look was happening. Sorry for the gross close-up, but you can see my icky problem here…. Yeah, not a good look. Hopefully you can see that the dry cracked “riverbed” look is gone. My skin is hydrated and moist. The age spots are still there, but that’s a separate issue! In five short days, the skin on my arms and legs went from a flaky, itchy, dry, cracked mess to smooth and supple. It’s not a magic bullet, though. Like any other lotion, you should put it on after washing your hands, after showering, and any time that your skin begins to feel dry. Now I am keeping my bottle on my nightstand for easy access. If you apply it daily, Vaseline Intensive Care WILL get your beautiful, soft skin back. I took the #VaselineChallenge, and I encourage you to take it, as well. It really made all the difference for my skin, and I’m sure it will for yours, too. Head to Walmart where you know the prices are the best! Why pay more? WOW! What a difference this product made!